As any Mac user knows, there often are multiple ways to achieve any task. For e-mail programs, you can choose from Eudora, Thunderbird, and Apple Mail to name just three. For word processing, there’s OpenOffice, Microsoft Office, Pages, and others. For instant messaging, you’ve got AIM, Yahoo, Fire, Adium… the list goes on. Podcast publishing is the same way. There’s more than one tool for doing the job, as I found out after my look at Cast Easy ( ). Nearly immediately after posting that review, I received several comments from readers saying that if I loved that program than I would be utterly enthralled with Potion Factory’s $30 Podcast Maker 1.1.8 ( ). And you know what? Those readers are right. …takes the drudgery of podcast creation—putting in ID3 tags in iTunes, manually uploading a podcast to a Web server, and making sure the XML files are configured properly-out of the equation. Podcast Maker takes this one step further, and, as a result, it’s superior to Cast Easy in a few different ways, starting with the interface. While I very much enjoy the Mac-like interface of Cast Easy, it switched from screen to screen too often. I have to click through four arrows in order to find the button to check whether or not my podcast is explicit or not. With Podcast Maker, it’s an easy pull-down menu found in the lower right-hand corner of the screen. Nearly every part of the podcast that needs to be defined can be located on the main screen without any effort at all. I also can drag already-produced podcasts to Podcast Maker, and the application automatically recognizes the date, episode name, and other information from the ID3 tags. Cast Easy doesn’t do this. 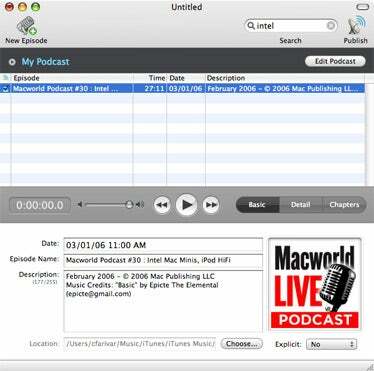 And Podcast Maker makes it possible to easily create “enhanced podcasts”—podcasts recorded in Apple’s AAC format with chapter breaks that are recognized easily on the iPod. For listeners with iPods that can display photos, Podcast Maker lets you link photos to various points within your podcast. Finally, under File: Preferences and the Advanced tab, you can set up a “ping”—a short message alerting various servers that you’ve updated your podcast. That way, the iTunes Music Store, for example, can know the instant you’ve updated. Otherwise, you would have to wait until the interval that outside servers happen to check your RSS feed. Podcast Maker also allows you to add your own servers to ping, such as audio.weblogs.com. In short, there’s probably a reason why tons of podcasters, including one of my favorite rock bands, They Might Be Giants, the United States Mission to the European Union, and even the PriusCast use Podcast Maker. I may soon join their ranks.